In addition to beaches, many of our coasts feature cliffs, which offer the landscape painter two options: stand on the beach and paint the towering rock, or stand on top and use it as a vantage point. Surprisingly few artists have chosen the latter, although exploiting high points inland is a common feature of landscape art. This article is the first of two to look at some of the best landscape paintings made from elevated positions at the coast, where, as the song says, on a clear day you can see forever. Caspar David Friedrich, Chalk Cliffs on Ruegen (c 1825-6), watercolour and pencil on paper, 31.7 x 25.2 cm, Museum der bildenden Künste, Leipzig. Wikimedia Commons. 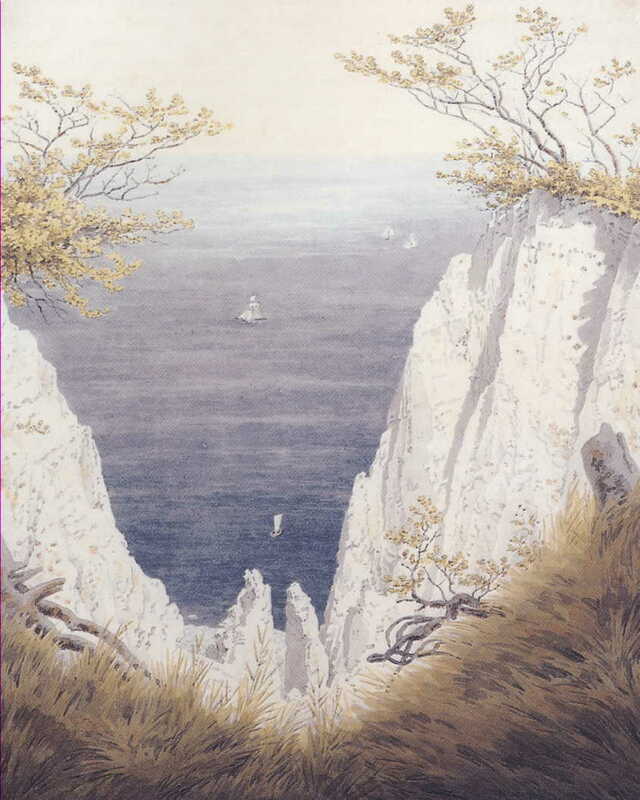 As with coastal paintings, and landscape art more generally, it was in the early nineteenth century that views from the cliff started to become popular. 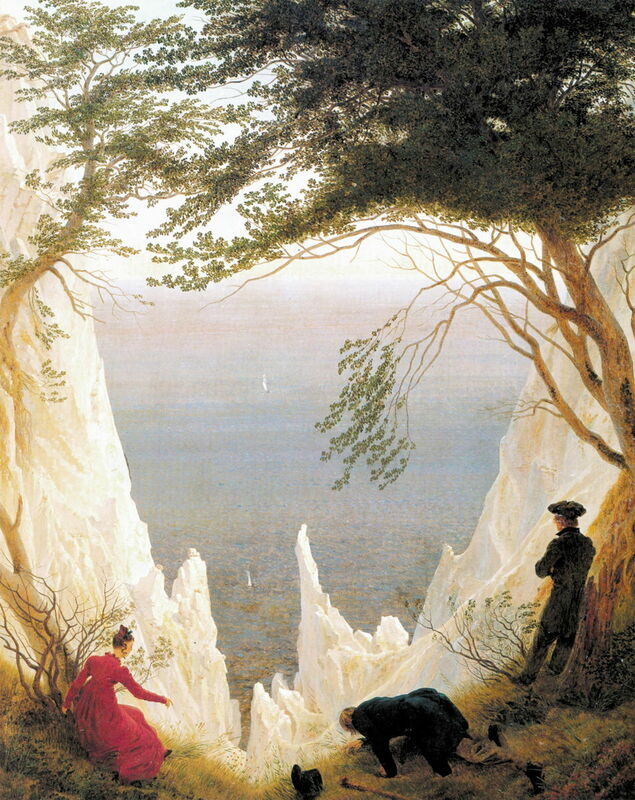 Among the earliest was Caspar David Friedrich’s Chalk Cliffs on Rügen, which he first captured in the marvellous watercolour above. He then turned its already dizzying view into the enigmatic oil painting shown below. Not only did he add the three puzzling figures, but he exaggerated the chalk pinnacles, and made the distant sails look like thin shards of chalk, to add to its vertiginous effect. With the growing popularity of oil painting en plein air, coastal cliffs became increasingly common motifs. 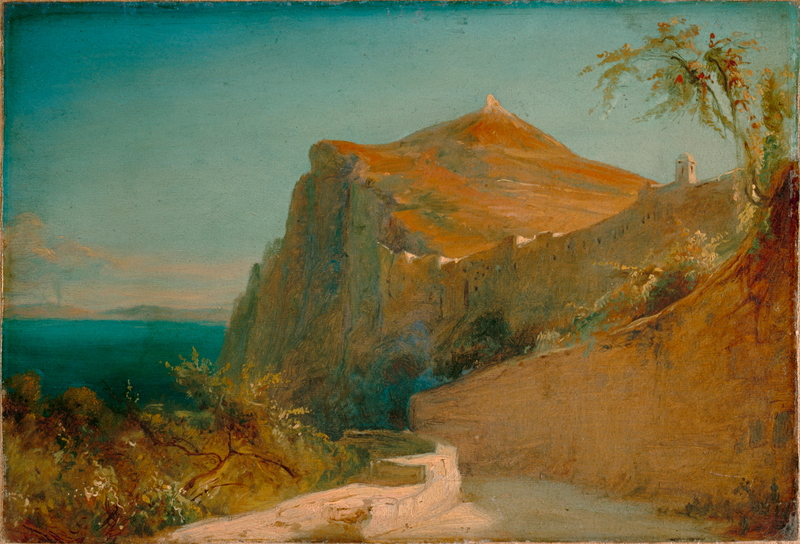 Another under-rated German painter, Carl Blechen, painted the superb view of the Tiberius Rocks on the island of Capri in 1828-9, when most of the plein air specialists were still working in the Roman Campagna. 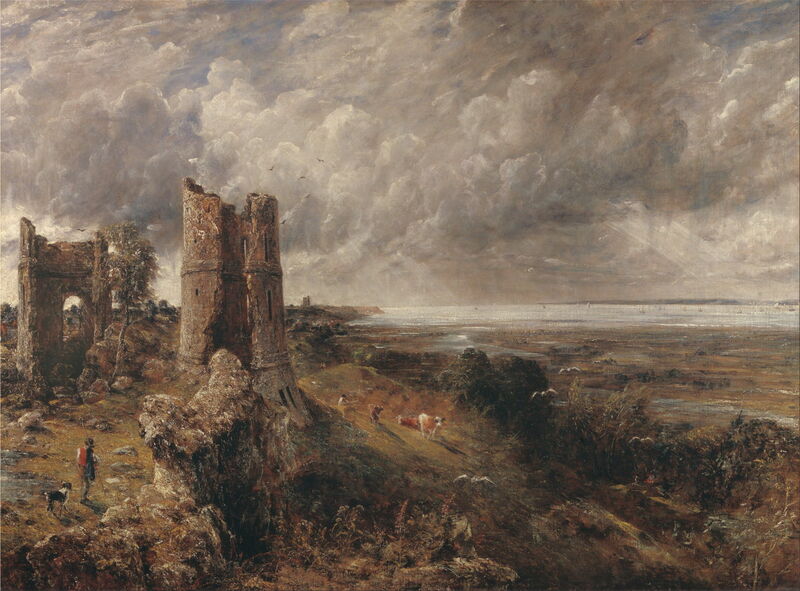 Oddly, neither Constable nor JMW Turner seem to have painted much from the clifftop; Constable’s coastal views are, I think, exclusively painted from the beach, with the notable exception of the expansive view of his Hadleigh Castle, The Mouth of the Thames – Morning after a Stormy Night (1829), below. Turner’s extensive coastal paintings were made largely (perhaps entirely) from down by the waves. For Turner, in particular, cliffs seen from below are part of the awe of nature which so many of his paintings inspire. John Constable (1776–1837), Hadleigh Castle, The Mouth of the Thames – Morning after a Stormy Night (1829), oil on canvas, 121.9 x 164.5 cm, Yale Center for British Art, New Haven, CT. Wikimedia Commons. It was only after Turner’s death, with the advent of Pre-Raphaelite landscapes, that British artists seem to have depicted the coast from on high. Richard Burchett’s View Across Sandown Bay, Isle of Wight wasn’t actually painted from the coastal cliffs, but he walked well up to a viewpoint to reveal this grand coastal panorama. 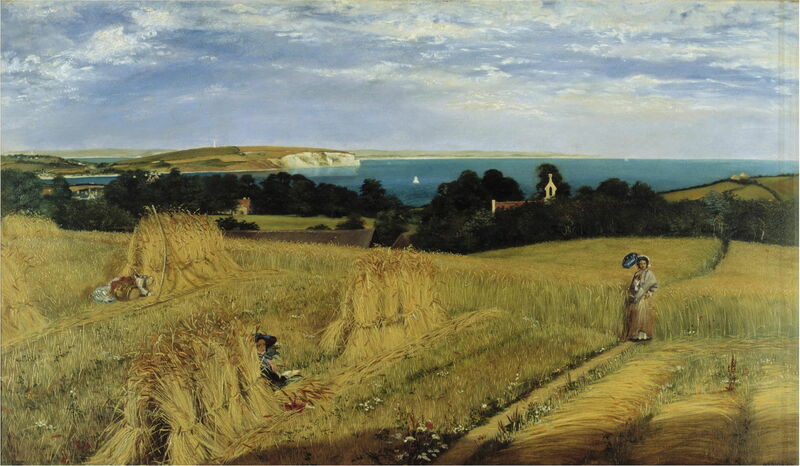 At about the same time, William Holman Hunt carefully composed his view of Our English Coasts, 1852 not from the beach at the foot of Covehurst Bay, near Hastings on the south coast of England, but from this spot known as The Lovers’ Seat above it. As if afraid to risk us becoming dizzy with the view down to that beach, he shows but a tiny fragment of the world below, unlike Carl Blechen. 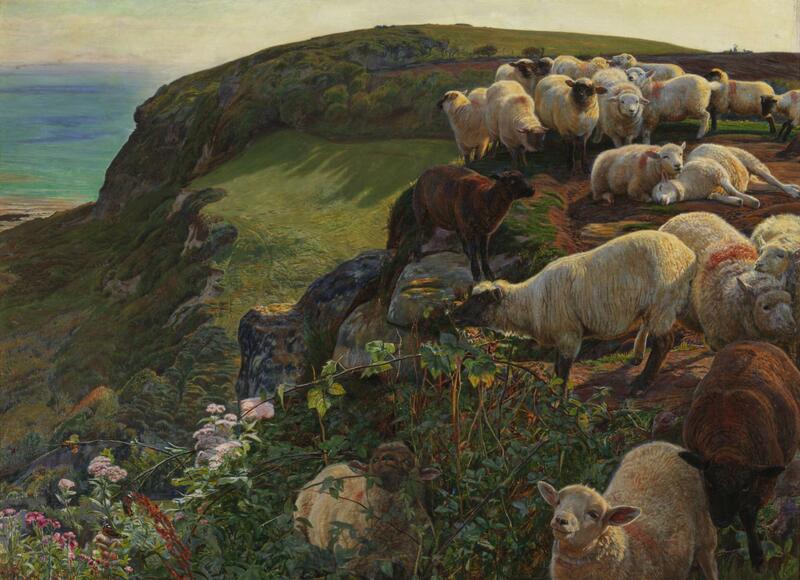 If there was one artist who made clifftop views popular, it was the Pre-Raphaelite and hyper-realist John Brett. Having shown his amazing eye for detail in early paintings of the Alps, he travelled down the coast of Italy doing similar with views of cliffs from cliffs. 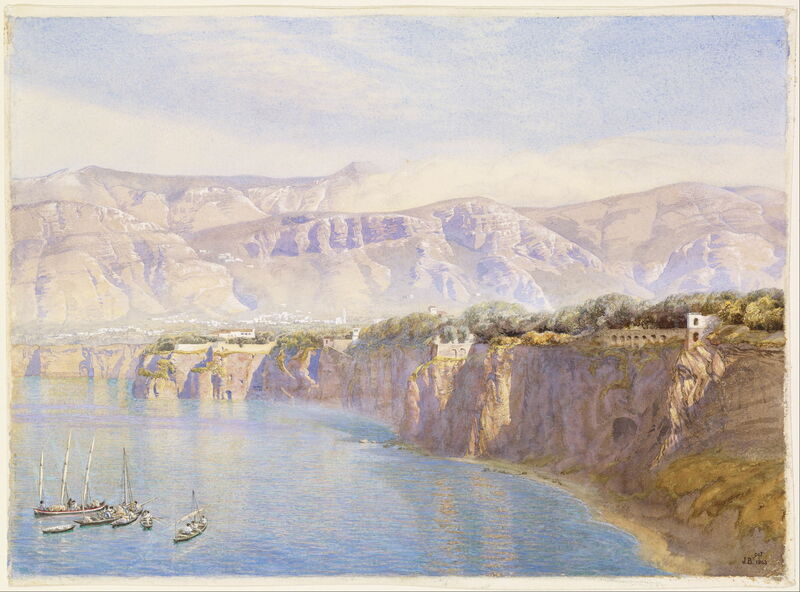 Brett’s Near Sorrento (1863) is a watercolour which Christopher Newall believes to have been painted from the Via del Capo, noted for its fine views, and shows the coastline which is at least five kilometres from that point. This makes it almost certain that its fine foreground detail was painted with the aid of a telescope. John Brett (1831–1902), Massa, Bay of Naples (1863-64), oil on canvas, 63.8 x 102 cm, Indianapolis Museum of Art, Indianapolis, IN. Wikimedia Commons. 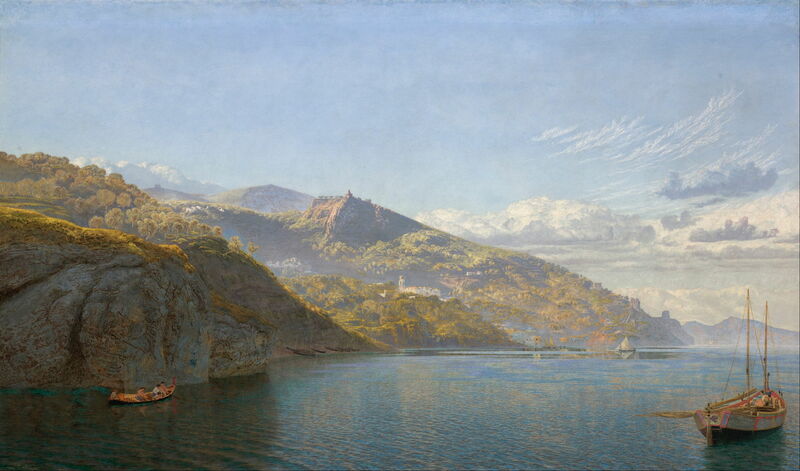 Massa, Bay of Naples (1863-64) is perhaps the most spectacular of the oil paintings which Brett completed during this Mediterranean campaign, and appears to have been painted from high on a vessel on the water. Unfortunately, Brett’s growing commercial success after that work sold spelled the end of his clifftop views: he bought the first of a series of boats, and increasingly painted his coastal views from sea level. 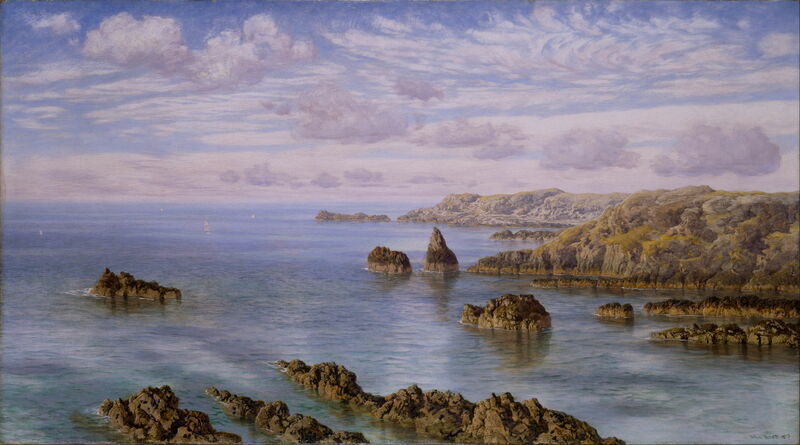 Southern Coast of Guernsey (1875) was the smaller of two substantial canvases painted following Brett’s cruise around the Channel Isles in the summer of 1874, and shows his interest in the coastline returning after he had painted several works showing the sea alone. He then painted looser and less detailed oil sketches when in front of the motif, such as his On the Welsh Coast (1882), and made his finished paintings in the studio during the following winter. Jean-François Millet painted occasional landscapes, particularly of the coastline near his home village. 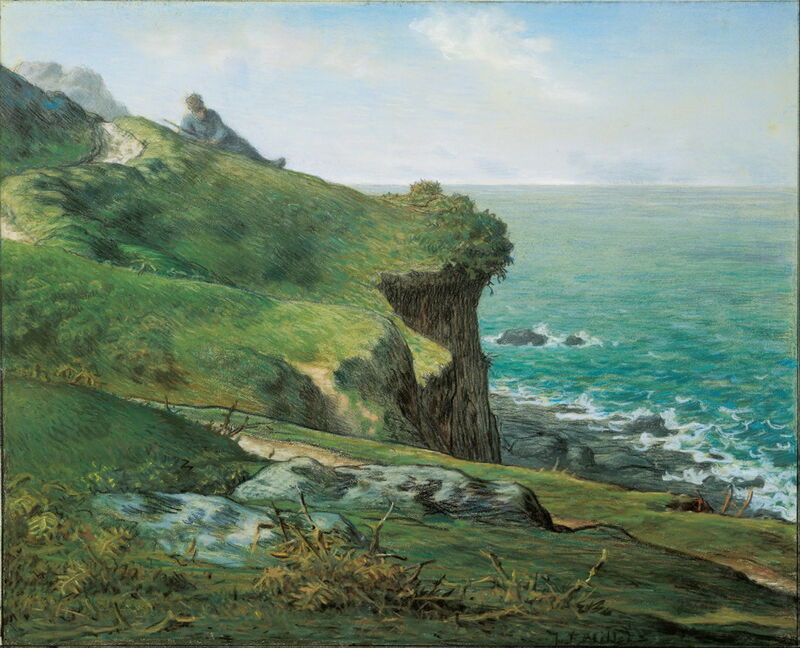 The Cliffs of Gréville (1871) is a fine pastel depiction which surprises by its unusual scaling and distance effects. At first sight, the more distant clifftop seems quite far away, but the man recumbent on the skyline establishes that it is in fact quite close to the viewer. 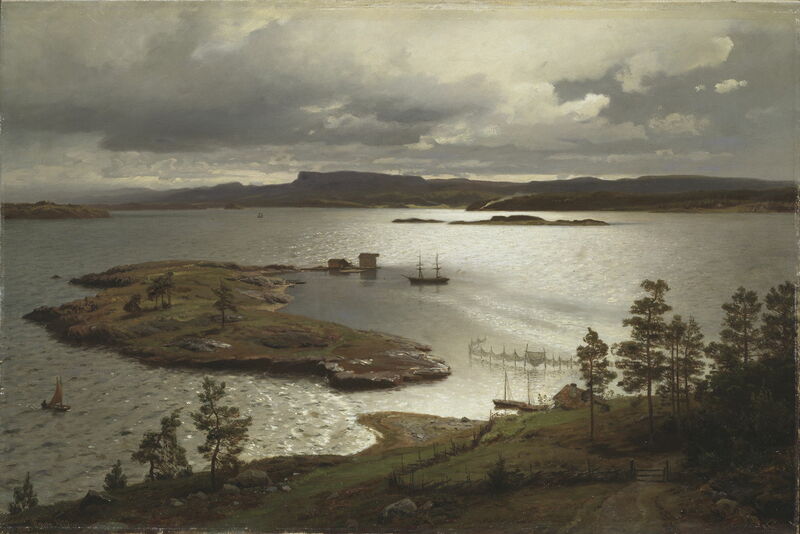 Hans Gude (1825–1903), Sandvik Fjord (1879), oil on canvas, 54.5 x 81.5 cm, Nationalmuseum, Stockholm. Wikimedia Commons. Brett was not the only nineteenth century landscape painter to have made views so detailed that they qualify as being hyper-realist. The Norwegian Hans Gude painted this startlingly detailed depiction of Sandvik Fjord (1879) from above Sandviken, now the northern suburbs of the Norwegian city of Bergen, looking to the west and the island of Askøy. Posted in General, Life, Painting and tagged Blechen, Brett, Burchett, Friedrich, Gude, Hunt, landscape, Millet, painting, Pre-Raphaelite. Bookmark the permalink. The Friedrich was painted on his honeymoon; perhaps it’s not a coincidence that the trees and grass form a heart shape. That had not occurred to me, although I am aware that one or both versions were supposed to have been painted when he was on honeymoon. The dates that I have seen given imply that the watercolour version might have been painted after the oil (with figures), which doesn’t seem to make sense to me. I have always assumed that he painted the (unpopulated) watercolour on his honeymoon, and the (populated) oil back in the studio later.